April 4, 2019 / Skokie, Ill. – A parade of animal-lovers and canine friends will be wending their way through Skokie’s Northshore Sculpture Park on Saturday, May 11, 2019—all to raise funds to support Community Animal Rescue Effort, an all-volunteer, nonprofit organization that has been matching pets with people since 1987. It will be the 24th year that two- and four-legged friends come out for C.A.R.E.’s annual Strut for Strays. Many are veterans. But each year, newcomers join in the fun—getting fresh air, a little exercise on the 21⁄2-mile trail and great up-close-and-personal views of dog breeds and hybrids of just about every size, shape and color. Actor Christian Stolte, from the popular NBC drama “Chicago Fire,” will once again serve as Strut’s grand marshal and get everyone started from our launching point, Evanston Subaru in Skokie, 3340 Oakton Street, Skokie. New this year, every registered Strutter will receive a T-shirt designed by nationally known artist Jay Ryan of The Bird Machine. (Jay, by the way, is the man behind the beautiful mural in our new Adoption Center). If you want to meet some wonderful pups, stop in at the registration/launching pad from 8:45 to 9:30 am. It’s an amazing time for checking out the dogs and getting some really cool photos. You’ll also find refreshments, a variety of vendors, a chance to win great prizes in our 50- 50 raffle, event photographer Mark Carlson and Mark Wilder of WilderPix Photography. And when the Strut is done, the fun continues. We’ll be gathering for an after-party at Village Inn, 8050 Lincoln Ave, Skokie, for eats, drinks and more good times (that’s doggies, too, if you dine on the patio). Details to come. With the opening of our new Adoption Center at 4927 Main St., Skokie, in the summer of 2018, C.A.R.E.TM now offers a combined adoption center-and-foster home model to better serve the needs of homeless dogs and cats, as well as potential adopters and the community. Strut for Strays is co-sponsored by Evanston Subaru in Skokie, Bill’s Heating and Air Conditioning, Bill’s Plumbing and Sewer Inc., Dog Obedience Group, Evanston Lumber, Lifeway Foods, Northshore Automotive, Old Orchard Smiles – Toni Ellis Wolf DDS, Organic Roots Eco Salon, Pet Supplies Plus Evanston, The Pony Shop, Remred Business Class Promotional Products, Riley Construction, Simple Machines Marketing, Village Inn and WilderPix Photography. Please help us spread the word about this unique event. The more strutters, the merrier—and the more funds we can raise for C.A.R.E. to continue to care for dogs and cats and find them forever homes. Our 501(c)(3) organization serves the North Shore communities of Skokie, Evanston, Wilmette, Winnetka, Kenilworth, Glenview, Northfield, Northbrook, Niles and Morton Grove, as well as the North Side of Chicago. And we are proud to have earned a GuideStar Gold Seal of Transparency, which verifies that funds donated to us go where the donors intended. What: Walk to raise funds for the all-volunteer, nonprofit Community Animal Rescue Effort (C.A.R.E.). On Saturday, Feb. 16, from 11 am to 3 pm, C.A.R.E. will host an Indoor Yard Sale & Open House at our Adoption Center in Skokie. February 7, 2019 / Skokie, Ill. – Be it rain or snow (or blue skies), Community Animal Rescue Effort will host its first Indoor Yard Sale & Open House on Saturday, Feb. 16, from 11 am to 3 pm at the Adoption Center, 4927 Main Street, Skokie, Ill.
Cat Pawsitive focuses on fun, positive reinforcement-based training sessions that go beyond playtime-as-usual to help cats connect more quickly with potential adopters. From teaching high fives and head bumps to “sit” and “come when called,” caregivers at Cat Pawsitive participating organizations engage with cats in a brand new way to really help cats to “click” with adopters. GreaterGood.org is a 501(c)(3) charitable organization that works to improve the health and well-being of people, pets, and the planet. Over the last 11 years, GreaterGood.org has given over $175 million in cash and in-kind grants to over 3,000 charitable partners worldwide. A grant from the Illinois Clean Energy Community Foundation has helped C.A.R.E. save money on water heating bills in order to help more dogs and cats find forever homes. JANUARY 2019 / SKOKIE, IL – A solar panel array on the roof of Community Animal Rescue Effort’s Adoption Center at 4927 Main Street, Skokie, may not be the most “adorable” part of the building (our cats and dogs wear that crown!). But those solar panels, purchased with the support of a generous grant from the Illinois Clean Energy Community Foundation and installed by Solar Service, Niles, Ill., are helping reduce C.A.R.E.’s utility bill considerably while preventing tons of carbon dioxide emissions from being released into the environment. The C.A.R.E. Adoption Center in Skokie will launch a twice-monthly Pet Food Pantry to provide food aid for area dog & cat owners in need. JANUARY 2019 / Skokie, Ill. – In a move to support area pet-owning families in need, including furloughed government employees, Community Animal Rescue Effort will launch a Pet Food Pantry. The C.A.R.E. Pet Food Pantry will debut Friday, Jan. 18, from 6:30 pm to 8:30 pm at the C.A.R.E. Adoption Center, at 4927 Main Street, Skokie. Subsequent Pet Food Pantry hours will run on the first and third Fridays of each month. always from 6:30 pm to 8:30 pm. ·We ask that clients refrain from adopting additional pets while involved in the C.A.R.E. program. The amount of food clients receive will depend on the number and size of their pets.Since our food comes from donated sources, C.A.R.E. cannot guarantee availability of particular brands. To apply for pet food assistance, please visit carenorthshore.org to fill out the application online. Clients can also fill out the application when they arrive at the Adoption Center. C.A.R.E. welcomes donations from our Amazon.com wishlist. C.A.R.E. accepts donated dog and especially cat food in its original sealed packaging (both dry and canned), with its “use by” date within 6 months of when you drop it off. Also welcome: donations of cat litter, dog and cat treats, new or gently used stainless steel bowls, collars, leashes, and or dog and cat toys. If you are interested in organizing a pet food drive at your school, house of worship or place of employment, C.A.R.E. will volunteer to help with distribution or pet food pick up. Pet food donations can be dropped off at the C.A.R.E. Adoption Center, 4927 Main St., Skokie, on Saturdays and Sundays from 11 am to 3 pm in the bright orange Subaru donation box near the reception desk. ABOUT C.A.R.E. : Community Animal Rescue Effort (C.A.R.E.) is a Skokie-based, volunteer-operated, not-for-profit 501(c)(3) animal rescue organization founded in 1987. C.A.R.E.’s mission is to rehome companion pets into safe forever homes; to serve as an educational and counseling resource; and to work to reduce pet overpopulation. C.A.R.E. operates an Adoption Center at 4927 Main St., Skokie, Illinois. September 2018/ SKOKIE, IL – Community Animal Rescue Effort’s newly opened Adoption Center has added a dramatic art installation that doubles as a way of financially supporting the organization’s animal rescue work. The installation, created by C.A.R.E. volunteer Karey Uhler, consists of an array of engravable discs, or Pet Tags. The silvery two-inch tags are securely attached to hooks and mounted in a grid on a matte-black wall. Every time the Adoption Center doors open, air movement causes the array to move and catch the light. “I like to think that the tags will offer a glimmer of hope and one day all pets will have tags that will lead them back to loving homes,” Karey says. Engraved C.A.R.E. Pet Tags serve as a unique way to honor special people or animals. Businesses can use tags to show their support of animal rescue. And with the holidays drawing ever nearer, Pet Tags make the perfect gift for that hard-to-buy-for person. A donation of $250 is all it takes for your inscribed Pet Tag to be placed on permanent display at C.A.R.E.’s Adoption Center. To order, download an order form from our website, CAREnorthshore.org/pet-tags, fill it out and send in. You can also place an order online at the same site. Funds raised by the Pet Tag Project go toward care of the rescued cats and dogs under C.A.R.E.’s charge. C.A.R.E.’s highly anticipated Yard Sale will take place Saturday, Sept. 15, from 9 am to 3 pm, at 1530 Seward, Evanston. All proceeds will benefit C.A.R.E. animals. August 30, 2018/ SKOKIE, IL – Calling all treasure hunters! 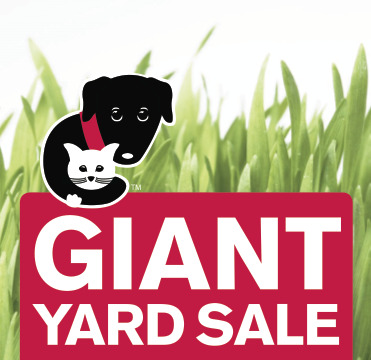 The tireless volunteers of Community Animal Rescue Effort will be hosting the organization’s highly anticipated Giant Yard Sale from 9 a.m. to 3 p.m. on Saturday, Sept. 15, at 1530 Seward, Evanston. Mark your calendar for C.A.R.E.’s Giant Yard Sale on Sept. 15 so you can discover treasures new and gently used. One day only, rain or shine. 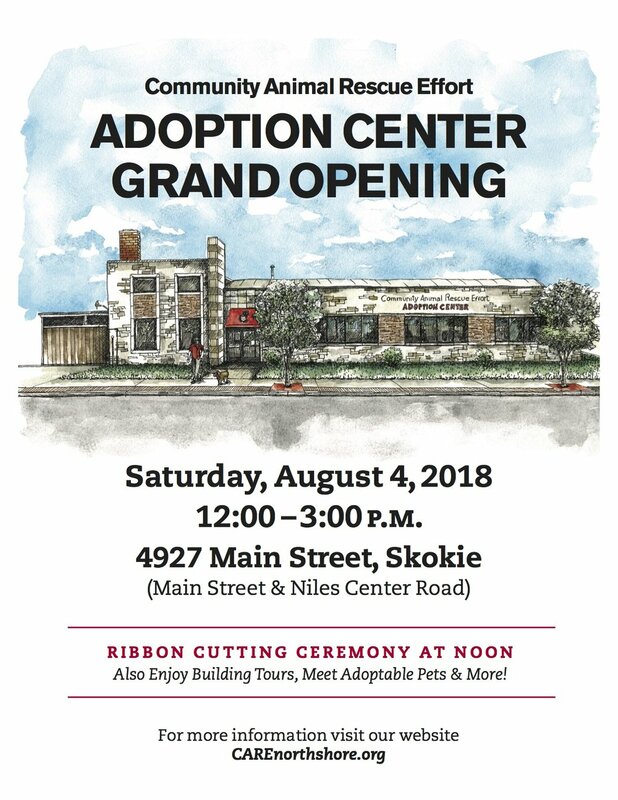 July 2018/ SKOKIE, IL – Community Animal Rescue Effort, an all-volunteer run organization for more than 30 years, is pleased to announced the opening of its new Adoption Center in Skokie at 4927 Main Street, Skokie, Ill.
C.A.R.E.’s official Community Grand Opening will take place on Saturday, August 4, from 12 pm to 3 pm. The event will start with a ribbon-cutting at noon, followed by building tours, opportunities to learn about volunteering, face-painting for kids, refreshments, and more. The brick building, on the corner of Main Street and Niles Center Road, is more than 100 years old. In its new life as an animal rescue facility, C.A.R.E. will be able to host up to 30 cats and 20 dogs. C.A.R.E. looks forward to welcome everyone to our new Adoption Center on Saturday, August 4, at noon. Visit C.A.R.E.’s Adoption Center at 4927 Main St., Skokie, on Sunday, July 22, from 11 am to 2 pm, to learn about volunteer opportunities with dogs, cats and more. C.A.R.E. is recruiting dedicated, reliable volunteers to feed, clean and socialize C.A.R.E. cats and dogs. We are also seeking people for general support roles – greeting, counseling, gardening, fundraising, event planning, publicity and more. Young animal-lovers aged 12-15 are welcome to volunteer with a parent. People age 16 and over can volunteer on their own. Fill out an application online at CAREnorthshore.org/volunteer-application. Please note that C.A.R.E. is 100% volunteer-operated. Available weekly shifts include dog care, cat care, front desk, adoption counseling, and landscaping & building upkeep. Dog Care: Assist with caring for, exercising and socializing our resident C.A.R.E. dogs. The fun work includes feeding, walking dogs, and socializing them by playing, training or grooming them. The dirty work includes cleaning kennels, laundry, washing dishes, sweeping/mopping, and, yes, scooping poop. Training to become a dog care volunteer takes approximately three sessions. You will learn about dog body language, the proper way to enter and exit the kennels, how to move through the kennel, how to leash the dogs up, and so much more. Dog care volunteers commit to a three-hour shift once a week: 9 a.m.-noon or 6-9 p.m.
Cat Care: Assist with caring for and socializing resident C.A.R.E. cats. Socialize with resident cats by grooming, petting, loving, talking to them and play/exercise. You will also be feeding, cleaning cages and ‘catios’, cleaning litter boxes, laundry, washing dishes, sweeping and mopping. Cat care training generally takes two sessions of shadowing one of our experienced volunteers so you can learn how to care for our cats. Cat care volunteers commit to a three-hour shift once a week: 9 a.m.-noon or 6-9 p.m.
Welcome/Reception Desk Representatives: Volunteers working C.A.R.E.’s ‘front desk’ will provide general Adoption Center information, field questions, and show visitors around. Also: help with paperwork, filing and other administrative tasks as needed. Volunteers commit to a three-hour shift once a week. Several training sessions are needed. Adoption Counselors: Adoption Counselors roles are to introduce potential adopters to our animals, answer calls about available animals, interview potential adopters, and assist with applications. Also: help with paperwork, filing and other administrative tasks as needed. Volunteers commit to a three-hour shift once a week. Several training sessions are needed. Landscaping / Building Support: If you’re a handyman or love gardening, you can work on projects that enhance and maintain the C.A.R.E. Adoption Center both inside and outside. For more information, email news@carenorthshore.org and reference Landscaping/Building Volunteer. August 7, 2017 / SKOKIE, IL – The seed for C.A.R.E.’s recently debuted “Precious Pays It Forward” project was planted back in 1992 when a C.A.R.E. adopter named Andrew adopted an orange tabby named Zucchini. The cat was Andrew’s best friend for 19 years. When Zucchini was in his later years, Andrew made a donation to C.A.R.E. in honor of his companion to subsidize the adoptions of 10 difficult-to-place C.A.R.E. cats. Fast-forward to 2016. A woman who had adopted one of the Zucchini Fund cats decided to also “pay it forward” by covering the adoption fee for a cat named Precious. And thus, the “Precious Pays it Forward” project began to sprout. If there is a C.A.R.E. dog or cat a supporter loves but cannot adopt for whatever reason, the Precious Project, powered by online donation site GiveGab, allows them to make a tax-deductible donation toward that animal’s adoption fee. Animals selected for the Precious Project are those who have been with C.A.R.E. for a longer-than-usual time. It could be their age, size or personality quirks that have made finding the perfect match more of a challenge. C.A.R.E.’s first Precious Project beneficiary is a tabby cat nicknamed Queen Agatha for her sometimes imperious ways. How to Sponsor: Supporters can make a one-time contribution on behalf of a specific C.A.R.E. cat or dog through C.A.R.E.’s GiveGab site. Here’s the link: gvgb.co/CAREnorthshore. PHOTOS attached: C.A.R.E. Cat Queen Agatha serves as the first beneficiary of the Precious Pays It Forward project.